Woxbic: Lambic-style Beer; Second Barrel, Second Year | Woxford Brewing Co.
About a year ago, I brewed my first lambic-style beer. I didn’t spend the time to do a turbid mash, but I did use the Wyeast guide for temperature infusions to provide a similar mash profile. During the past year, I’ve pulled a few samples, roughly once a quarter to ensure that the beer didn’t turn too acetic. Frankly, I’m impressed at how well it’s held up. 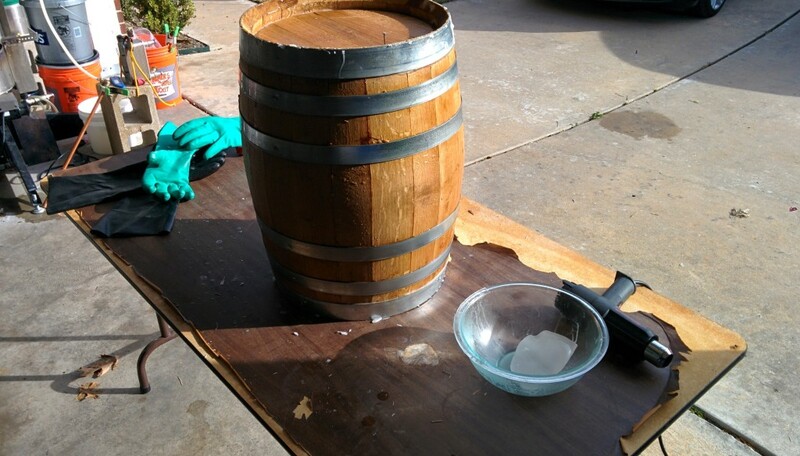 This is almost entirely due to applying a layer of paraffin wax to the entire barrel. At this point, the year old beer is exceedingly sour, about 3.0 pH. It tastes full of lemon zest, sour grapefruit, medium oak, with just a hint of vanilla whiskey, due to the use of a whiskey barrel. Clearly not as neutral as the Lambic I’ve tasted from Cantillon, Boon, and Drie Frontain. Nonetheless, it’s entirely acceptable for a year old sour to be tasting this well. For this year’s attempt, I’ve prepared a Rum Whiskey barrel. It’s had only two beers run through it, but it’s aged beer for nearly a year. It’s likely that there will be more barrel flavor contributed than the previous barrel, but that’ll be fun when blending. Hot water rinsing. Filled and drained completely three times with 150F water. Soaked both heads as well. 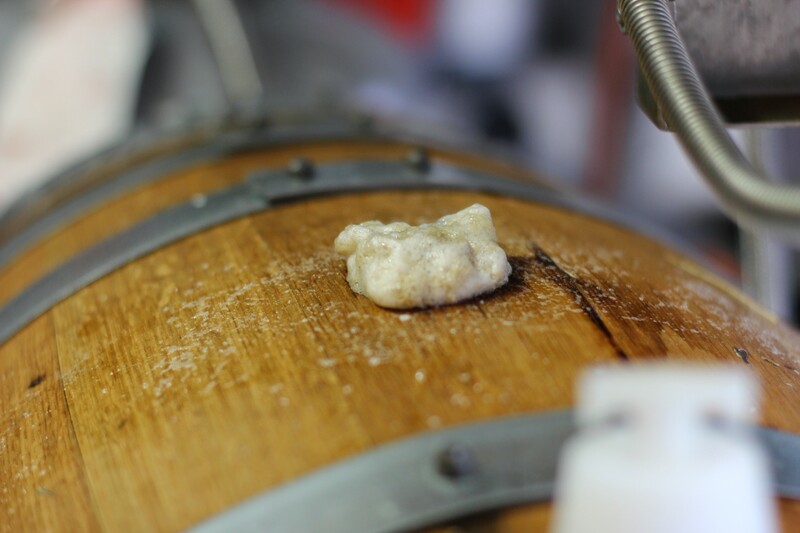 Steam-sanitizing the barrel. I used the guide on Embrace the Funk to construct a barrel steamer from a pressure cooker and a few extras. This hits 212F and stays going for 15 minutes. After cleaning, I used a heat gun to melt a block of paraffin wax. This took about 20 minutes. Much faster than double-boiler and basting it on. The recipe for this year will remain the same. The only major difference is the use of aged hops versus a small amount of very low AA hops. Last year I used Crystal @ 3 AA. This year I used two year old whole-leaf hops. Originally they were about 10% AA, but being old and exposed they provide a much lighter hopping and hopefully a bit more musty, cheesy funk one expects from great Lambic beer. I can’t wait to see how this one turns out over the next year. Pitching ECY20 Bugcountry in 11G barrel. - A little short on the sparge water; had extra but didn't get it into the mash tun. Ended up with 16G pre-boil, about .5 gallon short. 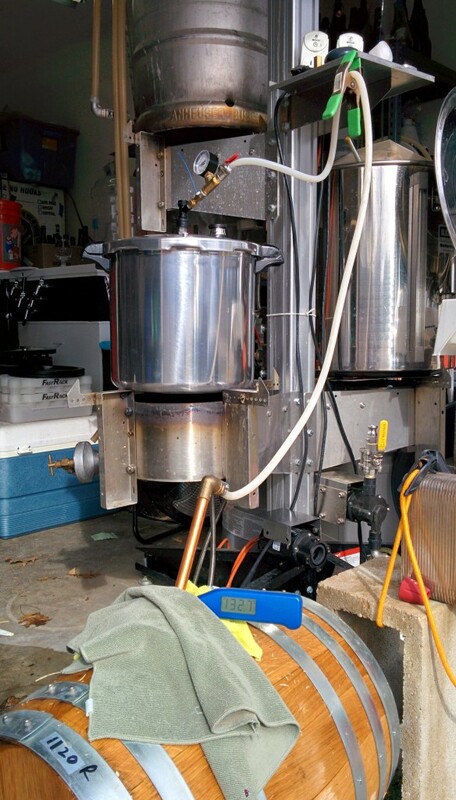 Upside, pre-boil gravity was up, 1.048. - 90 minute boil completed fine, ended up at 13.5G of 1.057 wort. - 24 hours till active foaming fermentation. Ambient temp in garage about 60 to 70F. Much warmer than last year, no need for heat belt to keep temps above 50. 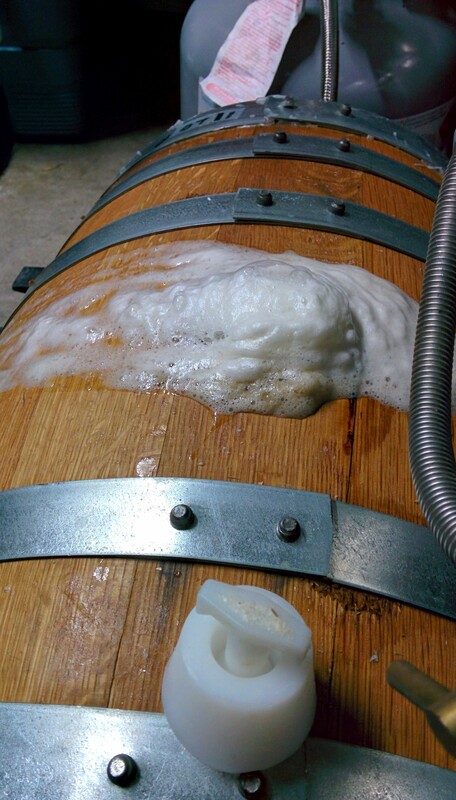 - 5 days until 5L flask "caught" enough blow-off yeast and outside air; then full active fermentation. Smells very belgium-like. 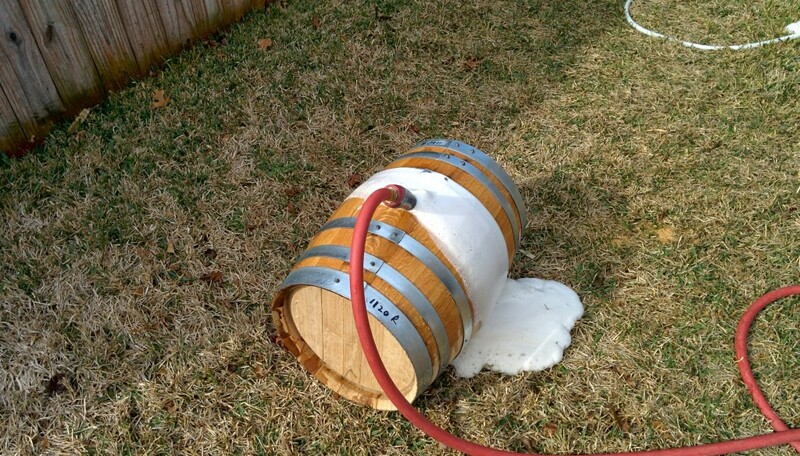 This entry was posted in Barrel Aged, Beer, Brett, Equipment, Recipe, Sours by funkmetal. Bookmark the permalink.